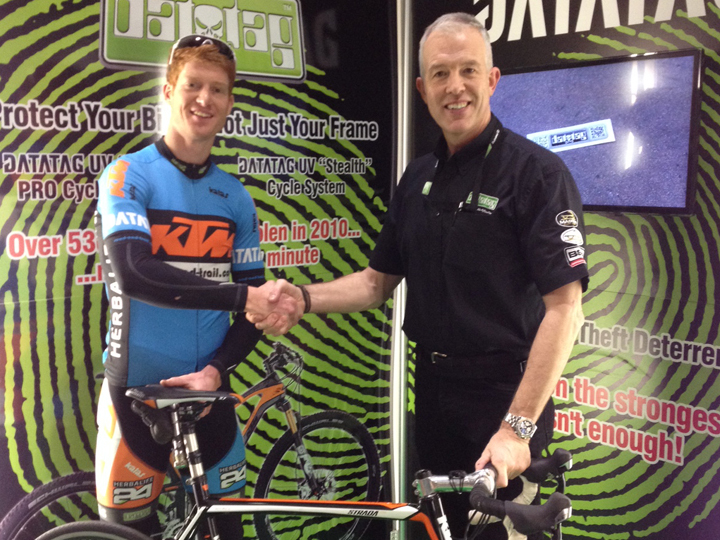 Datatag, market leaders in security marketing technologies, have signed a deal to support the KTM road-and-trail.com Pro Cycling Team for the 2014 season. 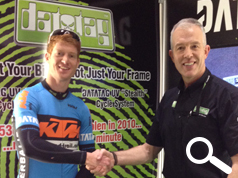 The deal will see all team bikes protected by Datatag’s new ‘stealth’ UV PRO systems which provide an unparalleled level of protection for an entire bike. As bike theft trends shift focus from whole bikes to components protecting an entire bike is not easy. DATATAG’s ‘UV Stealth PRO’ system allows owners to mark not just frames* but also valuable components such as cranks, derailleurs, forks, wheels and bars providing complete protection and peace of mind – something unique to the cycle market. The stealth ‘UV’ etches provide a unique ‘mark’* which, as almost invisible to the naked eye, keeps frames looking pristine whilst the microscopic Datadots**, again with a unique code, are held in a UV glue and can be ‘painted’ into hard to reach places in brake levers, derailleurs, seat posts etc. A tamper evident warning label completes the deterrent. This multi-pronged approach provides not only a high level of deterrent but also makes identification an easy job for the Police. Early results in the motorcycle industry confirm the effectiveness of such an approach in reducing theft figures. Datatag will be exhibiting at the London Cycle Show, ExCeL, from 13-16th Feb with a special show offer of 20% discount on all kits. Team rider Jack Adams will also be dropping by to sign autographs.